Netflix's YOU stars Penn Badgley and Shay Mitchell on playing another character on the show, real-life obsessions and more! If you've already seen all the episodes of Netflix's YOU, you would totally understand why it received a lot of good reviews. A psychological thriller set in the busy streets of New York City, Joe (played by Penn Badgley) who is a bookstore manager falls in love with Beck (played by Elizabeth Lail) who is a customer and quickly becomes obsessed with her. Joe's obsessive love for Beck comes with a few challenges – including Peach (played by Shay Mitchell), one of her best friends, who has her own complicated relationship with Beck. 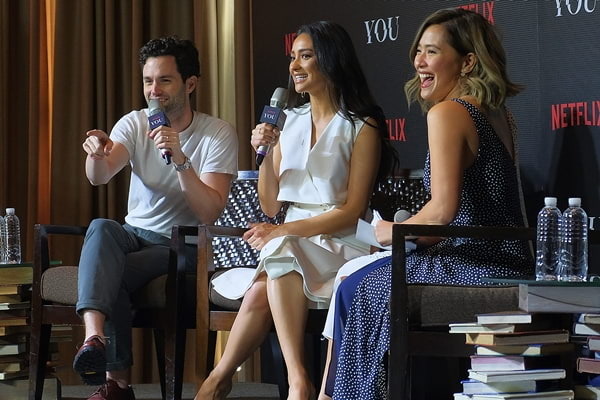 YOU stars Penn Badgley and Shay Mitchell are currently in Manila to promote the much talked about series. They will be having a special fan event tomorrow, January 15, at 5:30pm at The Greenbelt Gallery in Greenbelt 5 where fans of the show have a chance to meet and mingle with the stars. Penn Badgley: I was attracted to Joe through my conversation with Greg Berlanti and Sera Gamble who are the creators of the show. I was really resistant to the idea in a way. I actually thought that it was something that I wouldn’t do because I liked the project but the idea of playing Joe day in and day out for six months, for maybe six years who knows, I wasn’t sure. Shay Mitchell: What brought me to playing Peach was the fact that she was different from any character I've played and I wanted to play the bad girl. Penn Badgley: I think it has to do with giving in to our baser desires – we all have them. It’s not about thinking that we should be puritanical and not have these desires but what choices do we make? Joe makes every wrong choice, in every step of the way. But I think that's where we can see that he is like, he's just making terrible choices. It's been proven that charming, powerful men are capable of awful things. And we're also often willing to sort of forgive them almost every step of the way. So this is playing with that conversation and contributing to that conversation hopefully. I can't tell exactly what it is saying, I think we're all finding that out together a little bit. Shay Mitchell: What I believe to be the borderline is you can research and look up information that you know the person has put out there willingly. When I don't find acceptable is when you try and get information that's not out there – like addresses or numbers and that kind of stuff. Just use what the person has put out there and then it's not stalker-ish. Penn Badgley: I wouldn't have gone to the bookstore or I would have not called him ever. It was really sad for me because it's a sad story because Beck doesn't get out. If you watch it from the very beginning, it's so sad when she's like "hi" and he's like "hi!" because that's not what's happening. You think you're watching Gossip Girl at that moment, and that's the whole point, but that's not what's happening. It's very disturbing but that's the way abusive relationships start. So that's real. Whether my portrayal is realistic, that is real and there have been people that have been killed, women who have been killed by their significant other or abused and it starts like every other relationship they've understood. In one hand it's deeply troubling and it might be interesting if viewers are even willing to watch it a second or third time with that in mind, I think it takes on this whole other dimension and I hope the show holds up to that to that scrutiny. Hopefully, there's a lot of layers to what we've done. Shay Mitchell: A. I definitely would have had blinds, B. I would’ve taken Peach to therapy and I would have been honest with her and said, “you need help, you’re a mean person.” And then, with Joe, she didn't know what was going on. So, I think we can all do our own sort of trying to be as careful as possible. But at the end of the day, she didn't know that he was following her. So, what could she have done? Penn Badgley: It would probably be Beck because she's actually the best person in the show. Everybody's like, "nobody's good in the show" but actually Beck is quite like yeah, in the beginning, she's sleeping around but you know, everybody's making bad decisions in the show. But she's a victim to a lot of different social forces, not just Joe but like social forces as a woman and I think she doesn't get the credit she deserves. Shay Mitchell: I guess Beck because she has the most time and it would be opposite of me to play but then Anika or Lyn we’re really fun too – I just wish they had more screen time. Shay Mitchell: Food! I follow a lot of food, travel, pet accounts – that kind of thing. But, people? No. I don’t want to live anybody else’s life because I’m really happy with the life that I have. And I think more people would be if they stopped focusing on everybody else. Like, you want to look like this girl? Stop looking at her and go to the gym. Stop looking at people that are traveling. Work hard or make money so you can go there too! Create a vision board and manifest that. Stalk your own inspiration board – make that come to life. You’re never going to have another person’s life so create your own! That’s the message I keep wanting to get across. Penn Badgley: Tidying Up with Marie Kondo! Shay Mitchell: Oh my god, I just watched Birdbox and I’m not a fan. Not because it wasn’t done well but because I don’t like scary movies so I didn’t like it for that reason. Narcos! Hmmm, and then that Tidying show! YOU is now on Netflix. Stream it here.